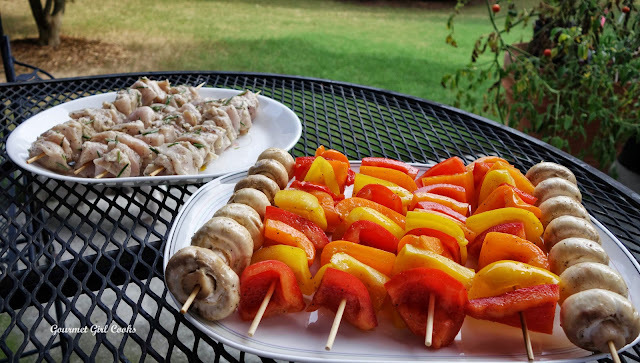 This evening I made grilled chicken and veggie kabobs for dinner and youngest son came over to eat with us. After running errands this afternoon, I cut up about 2 pounds of boneless chicken breast into chunks and placed them in a gallon-sized Ziploc bag so they could marinate. It was a super simple, fresh marinade. I added about 1/4 cup of olive oil, the juice of 2 lemons, 1 teaspoon Italian seasoning, generous grinds of sea salt and black pepper, 2 large minced cloves of garlic, and a large sprig of chopped fresh rosemary into the bag and sealed it, pressing out most of the air. I massaged the bag to mix the chicken and marinade together and placed it in the refrigerator to marinate for a few hours. I seeded and cut up 1 red, 1 yellow and 1 orange bell pepper into large chunks. I also cleaned and trimmed a small container of fresh mushrooms for my son and I (hubby doesn't eat mushrooms). 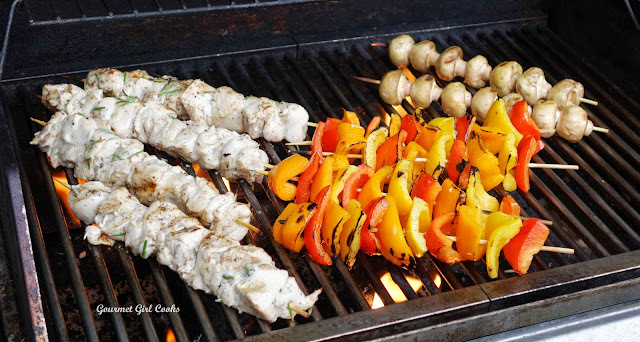 Shortly before hubby grilled our dinner, I threaded the chicken and veggies onto bamboo skewers that had been soaked in water for about 30 minutes to keep them from catching on fire while on the grill. I brushed the peppers and mushrooms with olive oil and seasoned them with sea salt and handed them over to hubby to do the grilling. They turned out great. 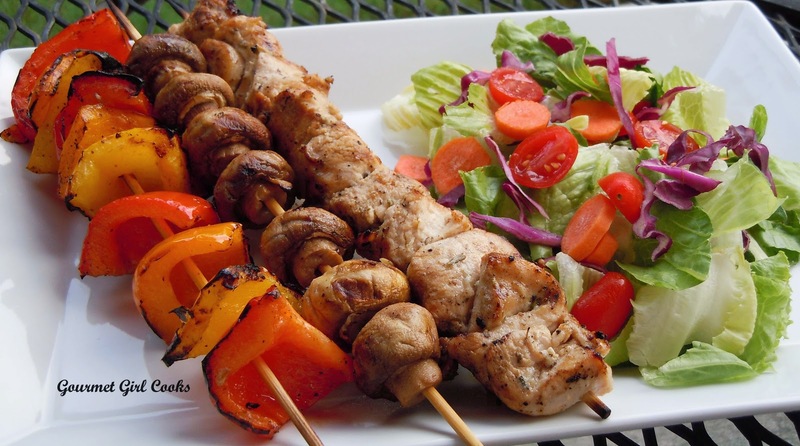 I enjoyed my kabobs with a side salad and the guys had rice with theirs. I snapped a few photos for you to see below. Enjoy!